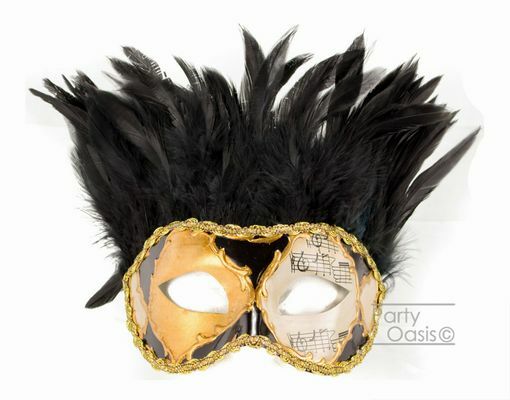 Men's Venetian feather mask has a raised gold diamond design. The right eye is gold, and the left is off-white with a music note design. Black diamonds cover the bridge of the nose, and sides. The mask features a gold ribbon around the edge, and a large plume of black feathers, approximately 5 inches tall. Each mask comes with black ribbon ties, and measures 6.5�W x 3.5�H x 3�D, approximately 8.5�H with feathers. Mask is mase of a durable plastic and is stronger than our paper mache masks.